Christmas came early for Lasswade RFC’s first and second teams for they have announced their continued sponsorship with one of Midlothian’s top car dealers. The club’s first XV are currently chasing for promotion to the BT National League Division 2 and currently sit fourth in the league six points adrift of league leaders Dumfries with a game in hand. And come the New Year, they will look even smarter after being kitted out by car dealership, Alex F Noble & Son in a new sponsorship agreement which clocks up an impressive 31 year association between the firm and the club. Lasswade RFC club president, Ian Barr said: “Our thanks once again go to Alex F Noble & Son for their continued support over an amazing thirty-one year period, but particularly over the last eight years as main sponsor. “Their new kit sponsorship, which includes home and away playing jerseys as well as shorts and socks for both the senior teams, allows the club to remain competitive at senior level. “We have a fantastic facility at Lasswade with one of the best pitches in club rugby and a super clubhouse which is a great venue for after match hospitality and entertainment. ‘‘Naturally, our facilities are expensive to run so the continuing sponsorship from Alex F Noble & Son is therefore greatly appreciated”. David Noble, dealer principle at Alex F Noble & Son Nissan said: “We’re very pleased to be continuing our association with Lasswade RFC into a thirty-first year. ‘‘The club president tells me the teams are proud to wear our name on their jerseys, which of course is very gratifying, but it’s also a great way of promoting the Alex F Noble & Son Nissan brand within the local community”. Elsewhere at the club, the 2nd XV have continued to improve with some excellent young players coming through the youth section. 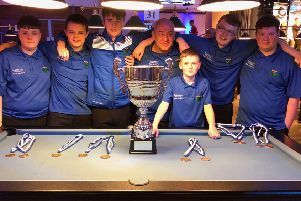 The youth section from S1 to under 18 is still growing and the partnership between Lasswade High School, wbhile the mini section from p1 to p7 is flourishing at all age grades.